Roast cashew nuts in the ghee. Soak Wheat for 2 days in water.Drain the water and grind the soaked wheat in the mixer or in grinder by adding2 cups water. Extract milk from the grounded wheat and again add2 cups water and grind& extract milk. Filter the milk with the small holed strainer(saladai) or in muslin cloth in the large bowl. Repeat this for 3 to 4 times till all the milk comes out. Keep the milk aside for an hour so that thick milk settles down. Thick milk settles down in the bowl and drain the water which is above the thick milk. In a thick kadai,pour wheat milk,sugar together and start cooking on medium flame. Stir continuously.Add kesar colour,cardomom powder &Pour ghee every now and thenafter halwa starts becoming thick. Halwa becomes transparent and will not stick to the kadai. Ghee starts coming out.This is the right consistency of this halwa. Add cashewnuts and mix thoroughly. Pour this halwa on the greased plate. While pouring on the greased plate,just don't keep the plate flat.keep it slightly sliding(tilted) so that ghee in the halwa comes out.how much ghee ,the halwa absorbed,all comes out.that's the speciality in this halwa. Optional: If u want to cut them into a desired shape,cut them after it cools down. Note:Irutukadai halwa doesn't have shape. i got bush orange & red colour powder,which is not giving exact colour of the irutukadai halwa but i assure u it tastes like irutukadai halwa. u can use the extracted pulp and add onion,red chilli powder,red chilli,hing and mix in besan and little water and make bakoda. Dear christy,thanks for voting and giving comments .especially this halwa comes out like irutukada halwa for me.this halwa and ukarai,vellappam,maaladoo are compulsory for diwali for us. 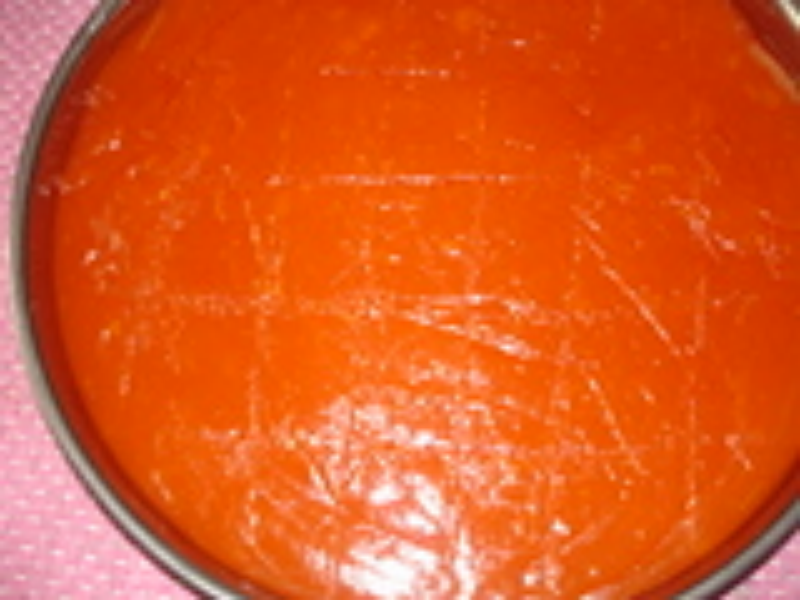 Iruttukadai Halwa - The most popular sweet of my nativity. Ur recipe is neat.